Malay Table Manners You Observe as a Guest in Malay Homes. 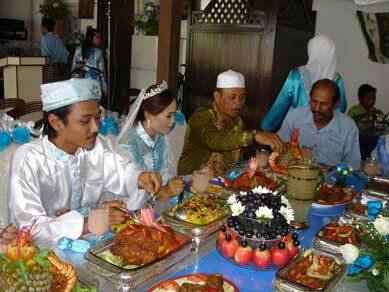 Like other races, Malay table manners is unique and the etiquette regarding food is also quite elaborate. 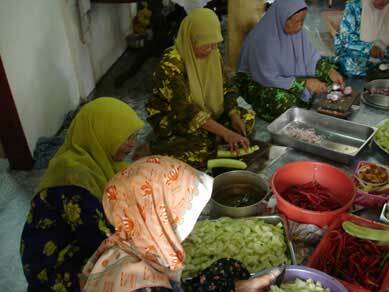 Malay culture has a few ways of handling food which are still practised until today. There are rules and taboos that you must observe if you happen to be invited to a Malay home for a meal. Malays are also invariably muslims, therefore there is no pork, non-halal meat or alcohol beverages served in a Malay home. I will cover the traditional ways of dining, modern ways of serving as well as the etiquette during the breaking of fast during Ramadhan. It is polite to bring a gift of fresh fruits to your host. This is called buah tangan. If it is a wedding reception at a village, it is nice to bring something sweet, like sugar, jelly or cakes in addition to your wedding present to the happy couple. It is also acceptable to give a gift of cash for the newlyweds, you place the money in an envelope and hand it to either parent of the bride or groom upon leaving. The envelope is slipped discretely into their hands when you shake them to congratulate them on their son's or daughter's marriage. Typical Malay village homes are built in stilt. They have a flight of stairs leading to the main hall. You are required to take off your shoes and clean your feet at the entrance. Most homes have a water pipe or a big earthenware jar called tempayan that holds water for the purpose. Traditional Malay feast is laid down on the floor. When all guests are seated facing a square piece of clothes called saprah (similar to a tablecloth but laid on the floor), food will be brought in. Malay meals are not served in courses, rather, all food are presented at the same time. Using a small bowl with water or ketor (a jug with cleaning water, together with a big bowl to catch the remaining water), you dip the tip of all your right fingers for cleansing. The meal will be eaten with your right hand. Left hands should never be used to handle food at any circumstances. The main dish will be rice, there will be three or four side dishes that go with the rice. Dishes with kuah will have a spoon for your to scoop the sauce, soup or gravy but for dry dishes, you simply tear a piece of the food with your right hand from a communal dish. Normally, female guests and children will be served on a separate saprah than from the men. The exception will be if the couple in question are honored guests or it is a small private affair. The way men and women sit are notably different. Men crisscross their feet in front of them - bersila. Women fold both their feet on one side - bersimpuh (normally on their right side). For those who are not used to this manner of sitting, it can be quite uncomfortable. Each grain of rice is sacred, you must clean your place. Hence, you only scoop enough rice for your own consumption and not too much. Do not chew and talk at the same time. Take each morsel in small bites and do not swallow in big bites. If there were two guests suddenly reaching out for the same dish, the elder would be given the honor to go first. If you tasted something and did not like it, do not place it back in the communal dish. Put it aside your own plate. Bones, shells and inedible residue may be placed on a special platter provided. Failing which, you put on the side of your plate. Food cannot be placed on its own on the floor as a sign of respect for the provision that God provides. Also, you must never point at the food (or anyone) using your foot. Even though the drinks are offered simultaneously, it is better to drink only after you clean your plate. Burping or belching is okay for men (they must cover their mouths while doing so) but farting is a big no-no. Now, let's cover modern Malay table manners. Malay table manners, essential at a Malay Wedding, here at Pulau Pangkor island. Nowadays, most Malay homes have normal dining table and chairs but still, the basic etiquette is still followed, especially regarding the respect of food. You will be served with a pair of fork and spoon but not dining knives. However, some Malay families adopt elaborate western ways of dining, you would be wondering if you have entered an English home by mistake! Now, let us cover finger food, snack and rules during teatime. For finger food, ketor or a bowl of water for cleaning your fingers usually are provided. If a sauce is offered, dip once in the communal sauce dish and eat right away. Do not dip the piece that you have tasted back for more sauce! This is okay of course if each diner is given an individual sauce dish. Tissue paper or serviette usually are prepared for you to wipe your mouth and fingers. If you must use a toothpick, use it while covering your mouth with both hands. If there are several pieces in the plate left, do not take the last piece left. What you can do, place the second last piece back into the plate and both remaining pieces are taken simultaneously by you and the person before you. There is a story behind this. It was said that the young lady who took the last piece of food on the plate would never get her match in marriage. Hence, the invention of this rule. However, the real reason is, the young lady should think of others before taking that last piece of food for herself. Sometimes, non-muslims are also invited for buka puasa. This is just an example of the hospitality offered by gracious Malay hosts. Buka puasa commences as soon as the sun goes down. The time can be found out by daily almanac and will be broadcast by the muezzin from the mosques. You may arrive between fifteen to thirty minutes ahead. It is nice to bring an extra dish as a contribution to the feast (like a potluck party). You must also ensure that the food you bring is halal. As soon as the time arrives, everyone will start the meal with a few piece of dates. This is to prepare the stomach which has been empty for the last twelve hours or so. Then, you sip a little water and can resume eating as normal. According to Islam, during breaking fast, you should only consume a little of food. After the Maghrib prayer only then you may eat the full meal. This makes sense because you will get stomach upset if you do not do so. However, it takes a lot of willpower to follow the teaching to the letter. A lot of people cannot wait to finish the big meal in one sitting. I hope my explanation above will be helpful for you to understand more about Malay table manners and also Malay culture in general. It is nice to learn about other common practices around the world. You will never know when you will be invited to dine at a Malay home. After reading about Malay Table Manners, why not learn some interesting Malay Proverbs?